There aren’t many restaurants where you can truly say you feel at home. The newly-opened Taverna Greek Kitchen in Souk Madinat Jumeirah offers a foodie escape to the Greek Islands, with Mediterranean flavours, waterside views and the freshest seafood in town. From authentic Greek dishes (Greek doughnuts, anyone?!) to unique mocktails using special Greek ingredients, Taverna is guaranteed to transport you to Greece in seconds. This homegrown concept feels like a local Greek family-run restaurant, complete with an open-style kitchen and friendly Greek staff. 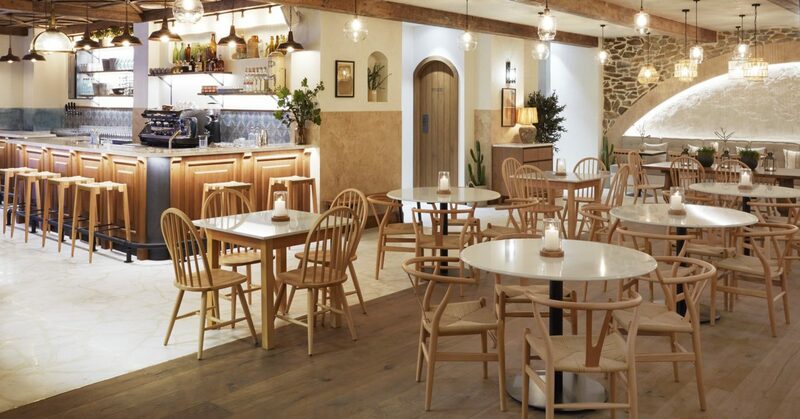 The restaurant’s Mediterranean roots are brought to life with rustic décor such as clay pots and wooden chairs on the wall, along with elegant stone, wood and marble finishings. For an even more memorable experience, enjoy al fresco dining alongside the scenic Madinat waterways. You’ll find a wood-fired grill at the entrance where all the meats, seafood (and even the pita bread!) get cooked to perfection. The seafood is flown in fresh from Greece daily; guests can take their pick from the catch of the day selection and request how they’d like it cooked (grilled on the wood-fired grill, baked, or salt baked with lemon oil). Starter: From the cold meze, we love the Ksidato Octopus – it’s slow braised octopus with vinegar, oregano, onion, Salicornia and extra virgin olive oil. The Taramosalata (creamy fish paste with salmon roe) is also a must-try; we thought we’d never say this, but it’s actually better than hummus. Main: The Taverna Special Grill is perfect for meat lovers, with beef, lamb and chicken served fresh from the wood-fired grill. Dessert: The Loukoumades (Greek doughnuts) pretty much speaks for itself. This traditional Greek dessert comes drenched in honey and topped with sugar, cinnamon and crumbled walnuts. Delicious! Bonus: If you’re a chocolate lover, Taverna’s Hot Chocolate – made with rich, melted Ion chocolate – is sweet satisfaction in a mug. All of Taverna’s mocktails are made using specially imported ingredients and are each named after a Greek Island. We tried the Helios – a unique concoction made with mastic sparkling water that’s originally from the island of Helios. Want a sneak peek at the restaurant? Check out our video for a quick tour of Taverna! Taverna Greek Kitchen is now open in Souk Madinat Jumeirah! For bookings or reservation enquiries, you can get in touch with the restaurant directly on +971 4 589 5665.
previousJones the Grocer Has Opened at The Dubai Mall… Finally!